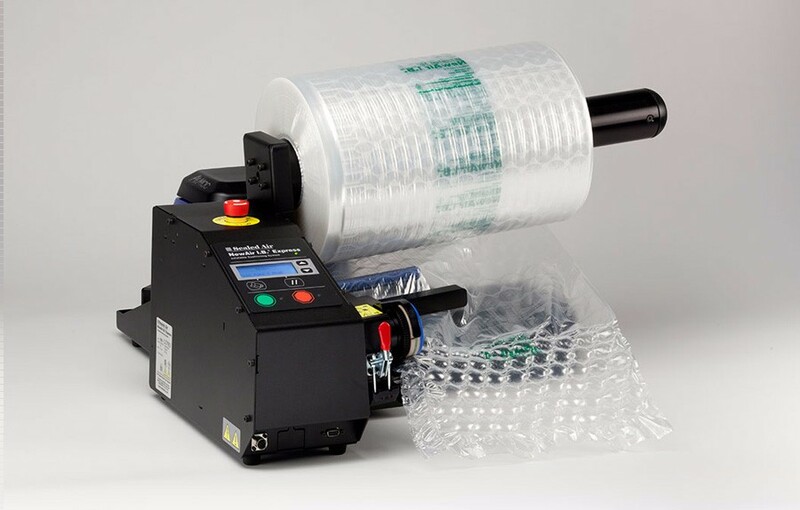 The NewAir I.B.® Express inflatable cushioning system quickly produces Barrier Bubble® material at 55ft per minute in 12" and 24" film widths - fast enough to keep up with the most demanding packaging operations. NewAir I.B. ®Express System is provided support by Sealed Air Inc. 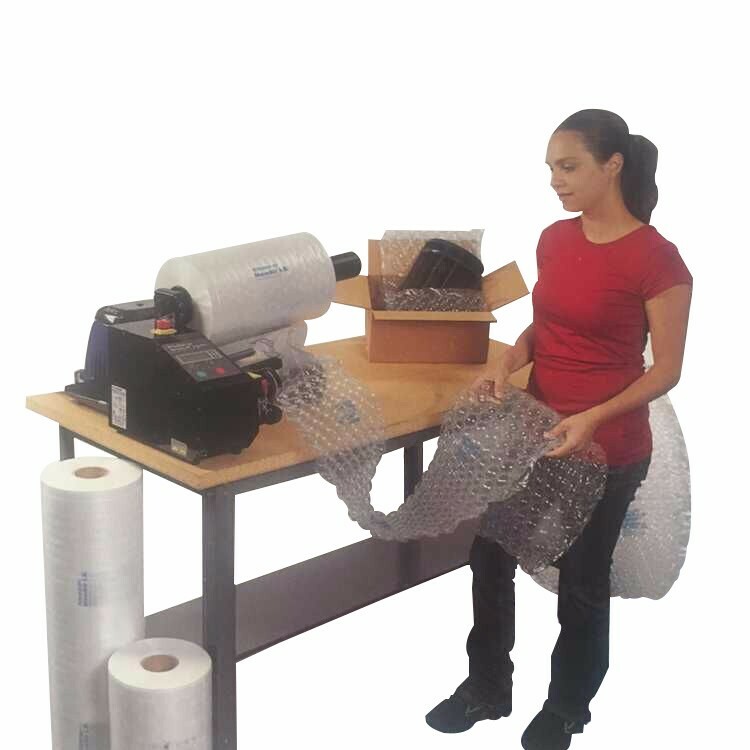 The NewAir I.B.® Express inflatable cushioning system quickly produces Barrier Bubble® material at 55ft per minute in 12" and 24" film widths - fast enough to keep up with the most demanding packaging operations. NewAir I.B. ®Express System is provided support by Sealed Air Inc.
Versatile - Small footprint and variety of batching, delivery and converting options fit almost any packaging environment. Save Valuable Floor Space - Fits on a tabletop or can be mounted on a table-side stand. 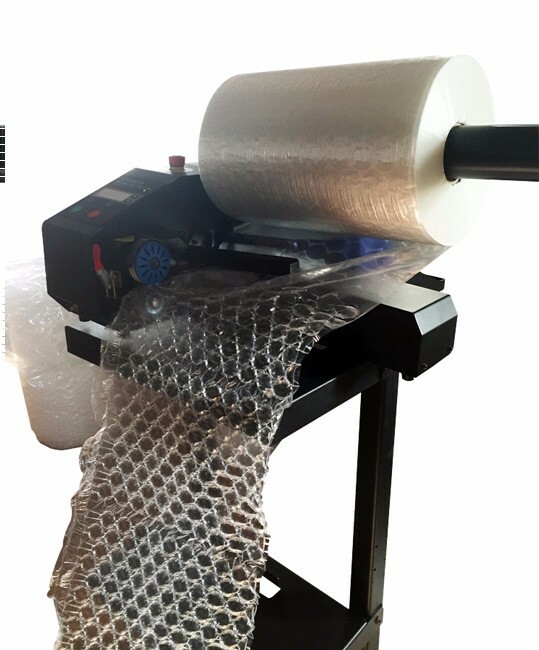 A single film roll can produce 5000 square feet of 1/2 inch Barrier Bubble® material, creating on-demand packaging and avoiding storage of bulky material. Responsible Packaging - Material is lightweight and inflates on-site taking up a fraction of the truck space to ship conventional packaging materials and reduces the transportation impact. Sizes Offered - Available in two different film widths, 12 and 24 inches, a variety of standard and premium film options as well as Anti-Static film. Available Accessories - Supported by a large array of system accessories including System Stand & Rollwinder, Instasheeter™ Converting System, and JetStream™ Delivery System.